Fly again with one of the oldest fighter squadrons of the Pacific in this 18 inch wooden F-8J of the VF-51 Screaming Eagles. 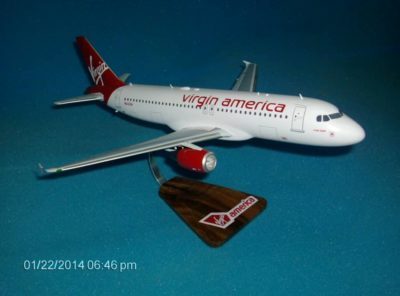 Each model is carefully carved and painted to provide a unique treasure piece. 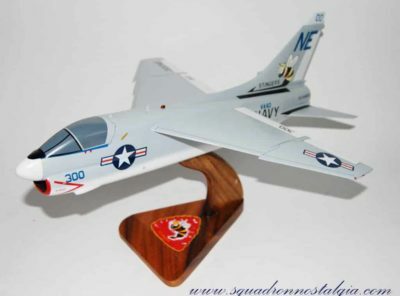 VF-51, Fighter Squadron 51 was an aviation unit of the United States Navy known as the “Screaming Eagles”. 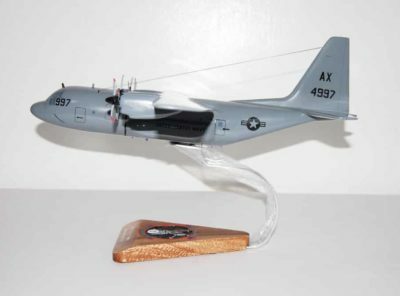 Originally established as VF-1 on February 1, 1943, redesignated as VF-5 on July 15, 1943, redesignated as VF-5A on November 15, 1946, redesignated VF-51 on August 16, 1948 and disestablished in March 1995. 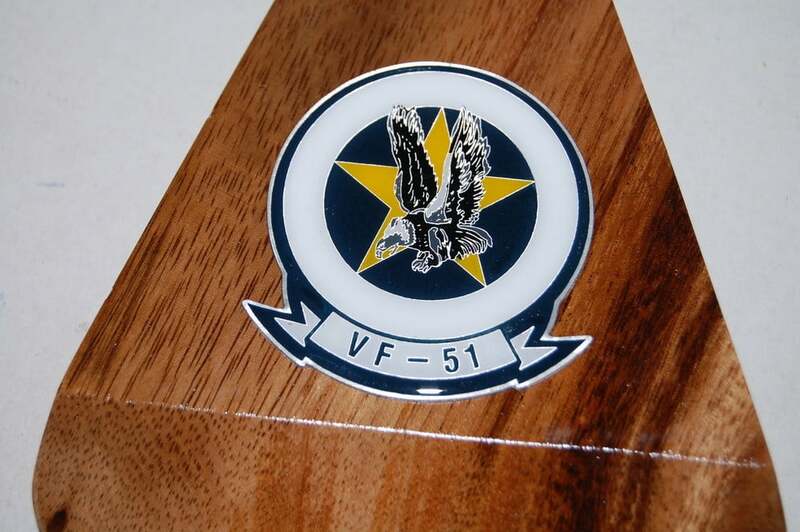 Until its disestablishment, VF-51 was the oldest fighter squadron in continuous service with the Pacific Fleet. 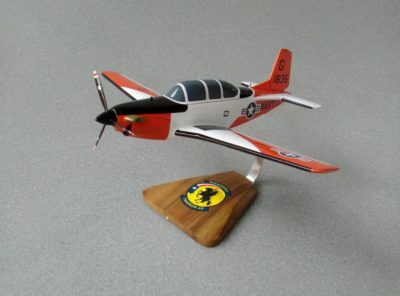 VF-51’s roots are traced back to 1927 when the Screaming Eagles insignia could be seen with the VF-3S Striking Eagles which flew the Curtis F6C-4. In October 1947, the Screaming Eagles became the first Navy squadron to enter the jet age with delivery of the North American FJ-1 Fury; the squadron used this fighter to conduct the USN’s first operational all-jet aircraft carrier landing at sea on 10 March 1948 aboard USS Boxer. 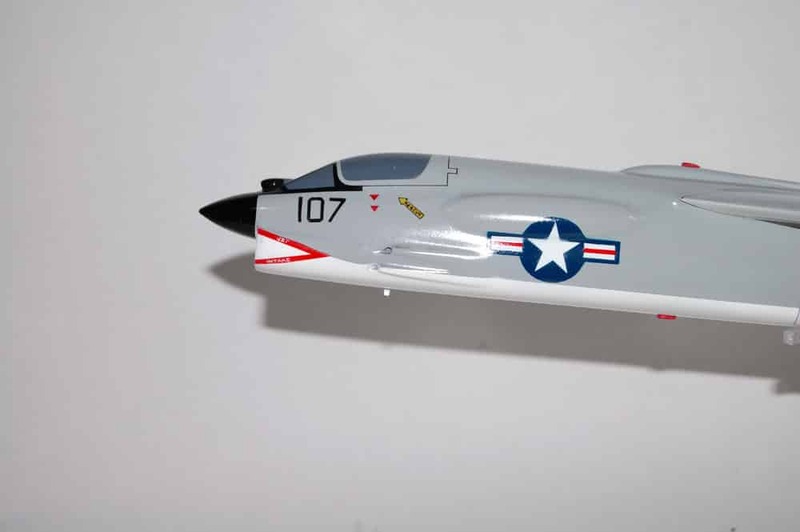 After transitioning to the Grumman F9F-2 Panther, VF-51 became the first squadron to take jets into combat and score the first air-to-air kills in the Korean War. Future astronaut and first man to walk on the Moon, Neil Armstrong, was also a Naval Aviator in VF-51 during this period. 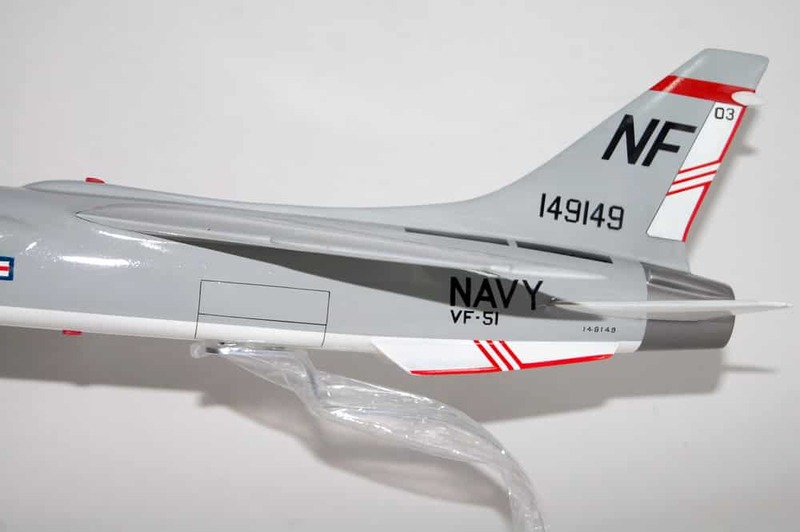 During the Vietnam war, VF-51 was the first squadron to evaluate the air-to-ground capability of the F-8 Crusader, and because of this, VF-51 was picked to fly secret interdiction missions into Laos in June 1964. 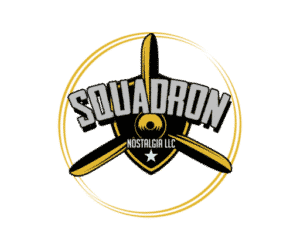 The squadron became MiG killers when they shot down two North Vietnamese MiG-21s in 1968. 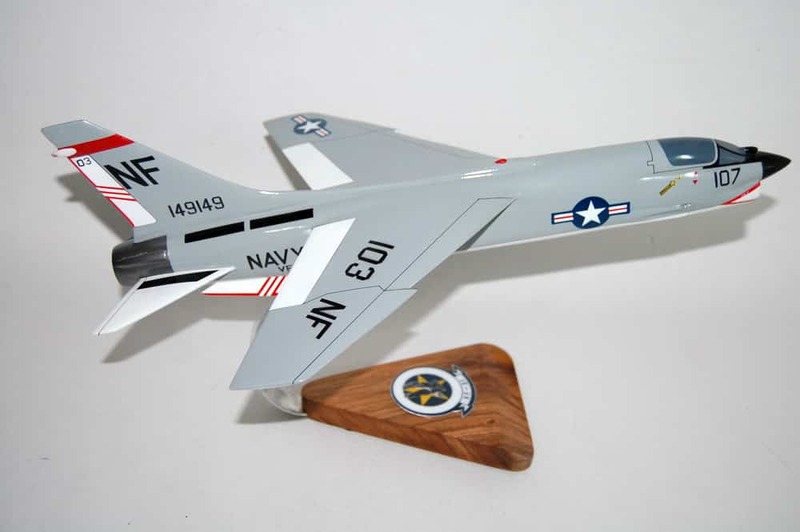 In 1971 VF-51 transitioned to the F-4 Phantom and shot down four MiG-17s. During the final stages of the war VF-51 flew from the USS Coral Sea (CV-43). In 1976, VF-51 and the rest of Carrier Air Wing 15 was deployed on a peacetime Mediterranean cruise on the USS Franklin D. Roosevelt (CV-42), returning in April 1977. The purpose of this cruise on a soon-to-be scrapped carrier was to take the first squadron of USMC AV-8A Harriers to sea. Following this Mediterranean cruise and return to NAS Miramar, VF-51 phased out its F-4 Phantom IIs. On 16 June 1978, VF-51 transitioned to the Block 100 version of the F-14A Tomcat and their first cruise with the F-14 was in May 1979 with Carrier Air Wing 15 aboard the USS Kitty Hawk. 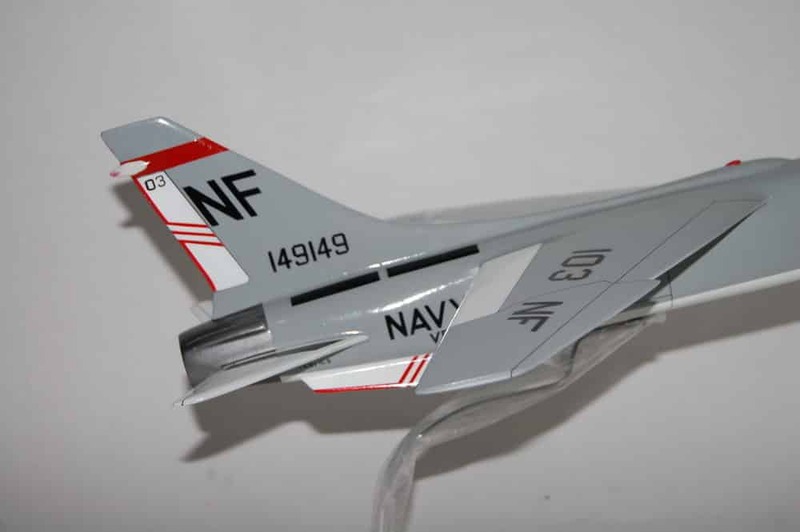 As part of CVW-15, VF-51 remained partnered with its sister squadron, VF-111, also flying the F-14. This cruise, originally slated to end in early December 1979, was extended by Presidential direction during the Kitty Hawk Battle Group’s final port call in the Philippines in late November 1979 as a result of the seizure of the American Embassy in Iran the same month and the subsequent Iranian Hostage Crisis. 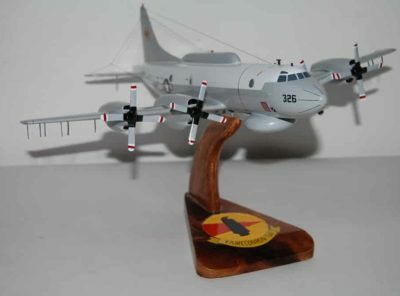 Both squadrons participated in the preparatory efforts to rescue American hostages in Iran, frequently intercepting both Iranian and Soviet aircraft in the region, but departing the Indian Ocean in February 1980 and turning responsibilities over to the USS Nimitz Battle Group and its embarked Carrier Air Wing 8 with VF-41 and VF-84 prior to execution of Operation Eagle Claw. 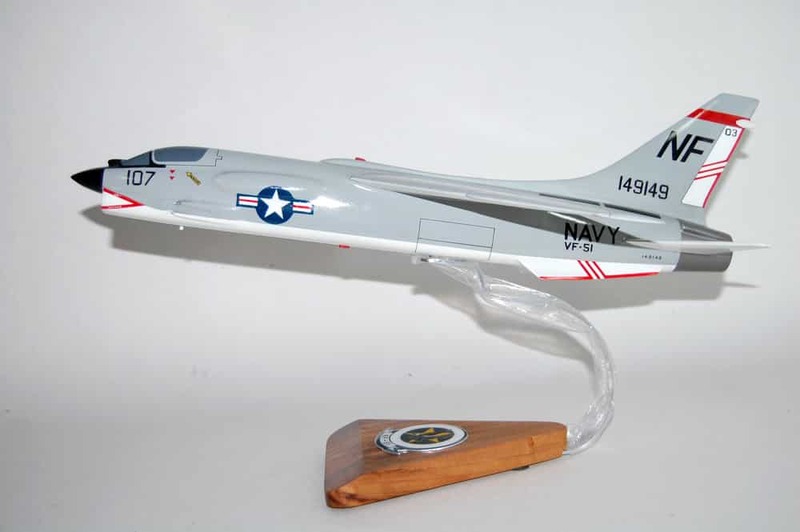 For this 1979-1980 deployment, VF-51 was awarded the Battle E as the top fighter squadron in the Pacific Fleet. 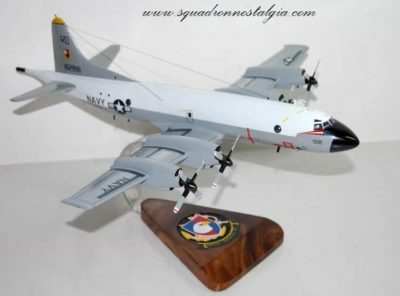 After one more cruise with the Kitty Hawk, the air wing moved to the East coast for a short period of time, flying from the newly introduced USS Carl Vinson from March to October 1983 as the ship transited to its new homeport of NAS Alameda, California and assignment to the Pacific Fleet. 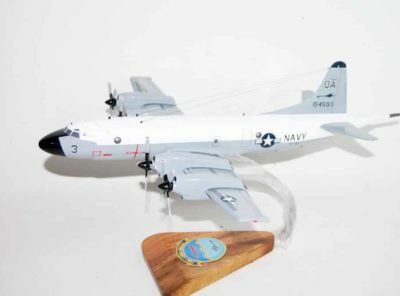 VF-51 is credited to be the first F-14 squadron to intercept Soviet Tu-26 Backfire bombers, armed MiG-23 Floggers and Su-15 Flagons using the Tomcat’s TCS (Television Camera Sight). The TCS allowed the crew to passively identify a target to determine if it’s hostile or not. During the 1986-1987 cruise with the USS Carl Vinson, VF-51 conducted operations in the Bering Sea during the winter. In February 1990, the USS Carl Vinson conducted operations in the Western Pacific and Indian Ocean. VF-51 and VF-111 took part in several exercises with regional air forces, including Singapore, Malaysia and Thailand. The air wing returned home on 29 July. 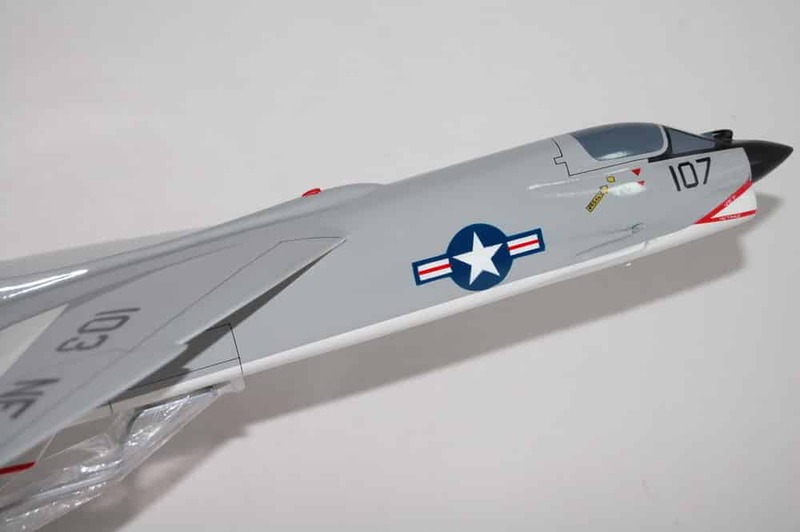 Original Navy plans saw VF-51 and VF-111 becoming the first deployable squadrons to transition to the F-14D Super Tomcat, however these plans were cancelled in December 1991 and VF-51 spent its time to its disestablishment in March 1995 flying the same F-14As it had transitioned to in 1978.